It's kinda hard being Sean's B-L-O-G. I made a Dinosaur Comic! Turns out it isn’t too hard. I really am making potato salad though. Wow! What an amazing comic! Praise from the master, sweet! Also, please forgive my oversight not including The System in “Friends’ Sites”. My error has been corrected. 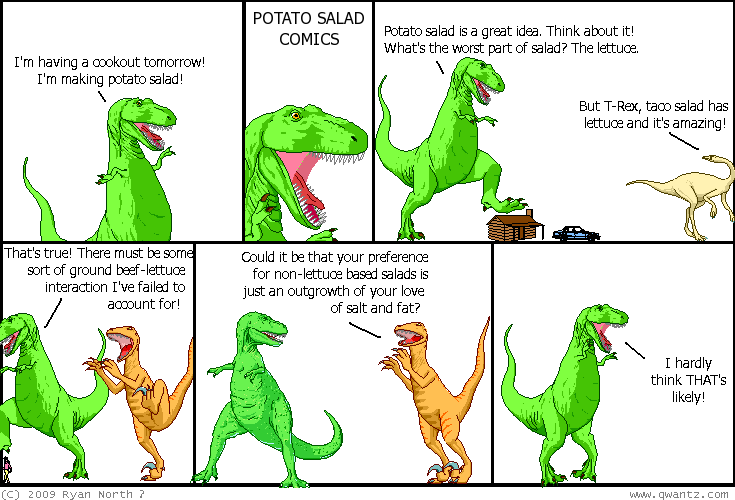 That is without question, the funniest Dinosaur Comic I’ve ever read, but mostly because i can envision that conversation taking place with you and any number of other people.